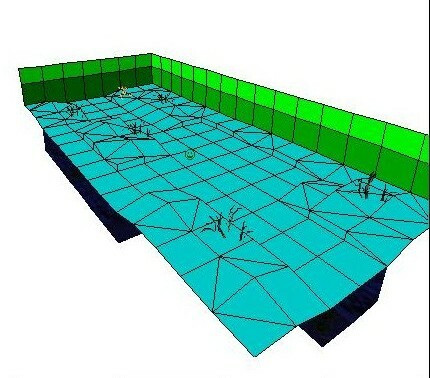 We are going to make an island in a river course with a current that Lara will be able to swim upstream against. So that Lara doesn't keep getting stuck in corners, we are going to use a number of sinks so that she will flow easily with the current. To keep things simple I'm going to use a fairly shallow river around the 4 click deep mark. Make your river and island rooms, join them up, and then texture and light them. 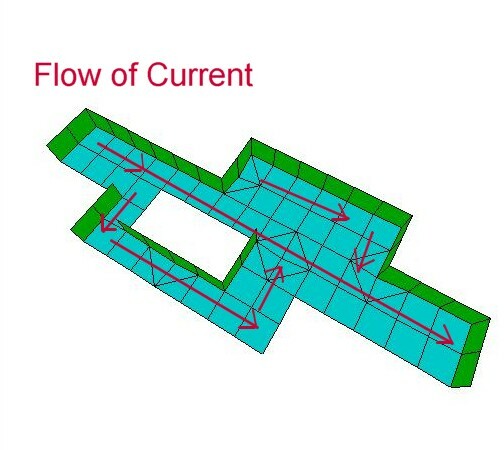 In our example, the current is going to split and flow around the island, then join up again and continue downstream. Select a sink from the menu and place it where the current is ultimately going to flow to (NOT where the current is going to flow from). 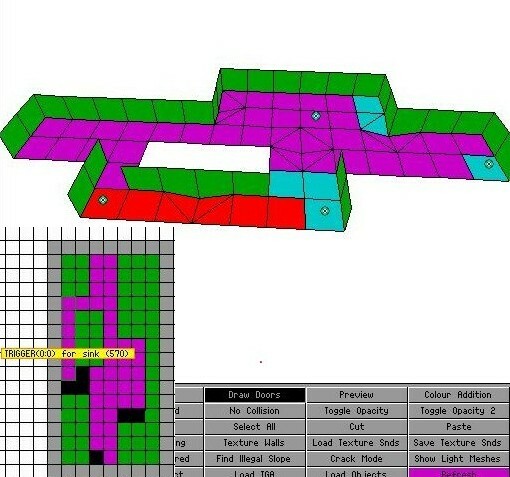 Highlight the Sink, bring up the OCB settings using the 'o' key and set the sink strength to 2+4. Note that hitting 2 + 4 gives the sink a strength of 6. You can have the settings as high or as low as you like, and you can mix the OCB settings and add them together to adjust the strength of your current. Have some fun experimenting. Watch carefully where I set the triggers for this sink. Notice that I didn't put a trigger for it on the same square as the sink. If I did, Lara would get stuck on that square. When Lara reaches the actual sink square, she will be able to surface and climb out. 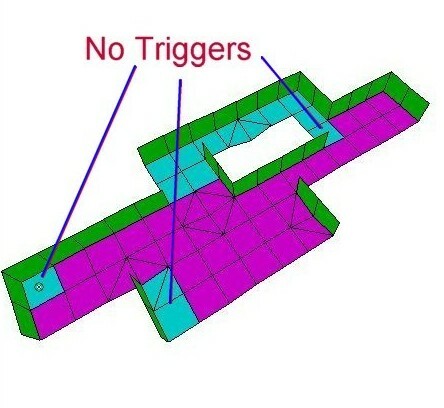 Also notice that I have not set triggers for the sink around the island either. Using just one sink, Lara would get stuck at corners and her movement would be extremely ungraceful. So I have not set triggers for our first sink at the three corners where she would get stuck. It is important not to put a trigger for a sink on the same square as the sink or Lara will get stuck. The trick is to have another sink which will pick Lara up as she moves onto a previous sink. 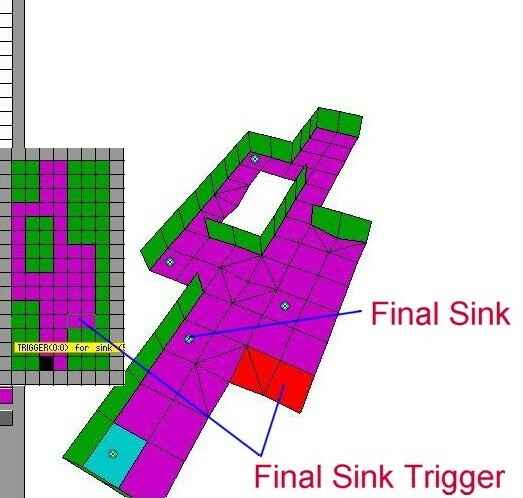 Select the 3rd Sink, give it an OCB setting of 6, and place a trigger for it on the three remaining untriggered floor tiles around the island. 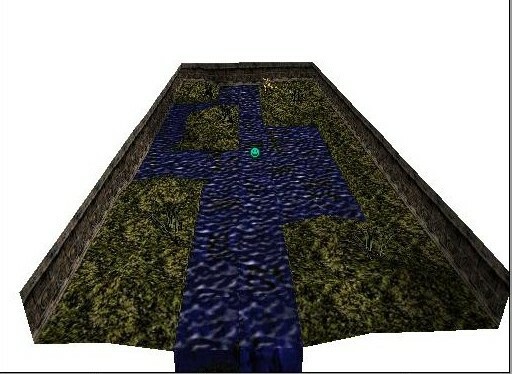 This sink will draw Lara back into the current of the first sink where the main current will then pick her up and draw her downstream. Once that's done, do the same thing on the water course in the bay on the other side of the river. 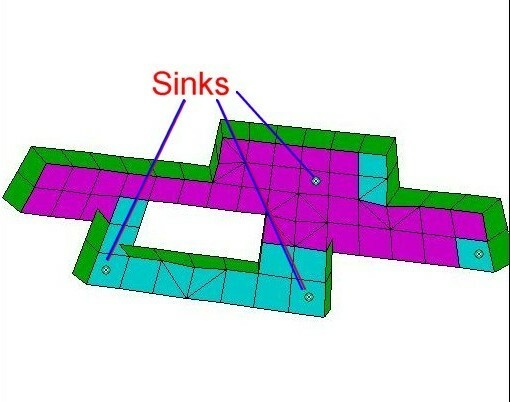 How sinks work can now be understood. As Lara reaches a corner she will stick if a sink trigger is further downstream. So you need another sink to gently pull her away from the corner and back into the main 'flow'. In this case, she will be gently taken around the island by the other sinks until she again reaches the main current. If she swims into the bay, she will flow downstream until the final sink picks her up and draws her out into the main current again. So, this is the situation: Lara falls/jumps into a river with a stream. The stream moves her towards the waterfall (i.e. the dangerous end of the river), where she falls through. She falls down in the air, into the lower part of the river below her. 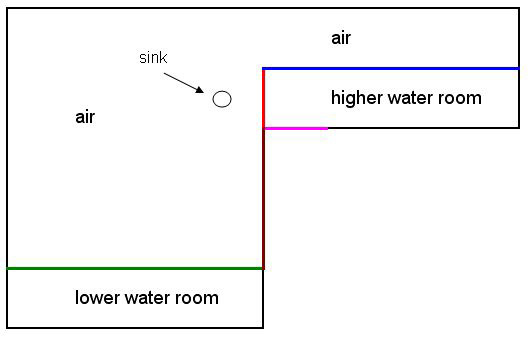 The trick is easy: place the Sink bulb for the stream not INSIDE the water room but OUTSIDE that, in the air. First of all, you need a room which is 'the higher part of the river'. It has a usual water surface over it. 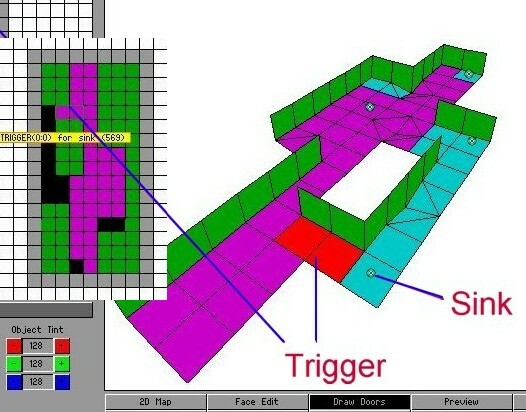 One of the room walls is not solid but a Toggle Opacity2 (traversable) surface, with transparent/double sided textures on it. The texture tiles here are parts of an animated range of a waterfall. 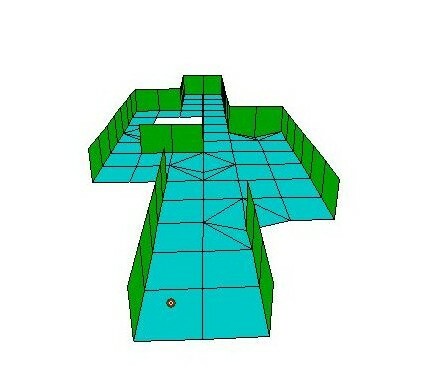 This traversable surface is the traversable part of the waterfall. On the other side of this surface, there isn't a water room, but there is an air room. Blue: usual Toggle Opacity2 transparent/double sided animated water surface texture, for water which is streaming horizontally. 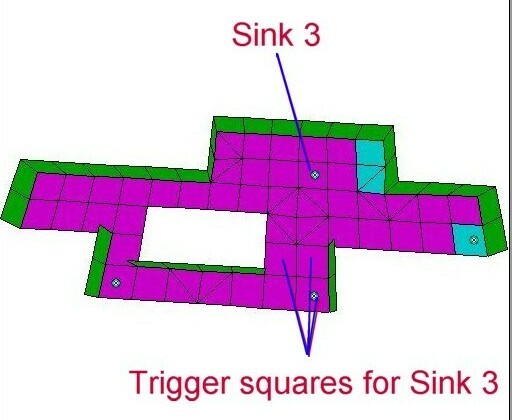 Magenta: trigger for the sink. Green: usual Toggle Opacity2 transparent/double sided animated water surface texture, for calm water. 1. 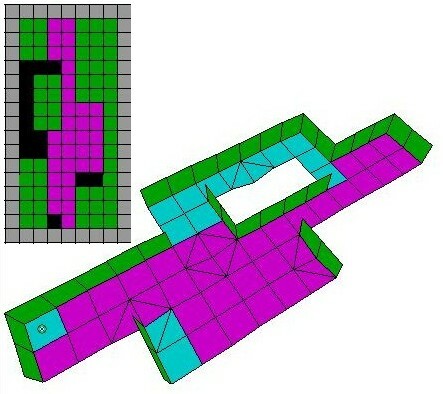 The connection of the horizontal and vertical water surface in the higher water room is ugly, you may place a waterfallmist object or something there to hide that. 2. If you use TRNG then don't forget to select the proper animated range types for the different water texture tiles.